Playing A Key Role in Veterinarian's Journey • Our Town America, Inc.
Our Town America, the nation’s premier new mover marketing franchise, is committed to helping families settle into their new community. From restaurants to gyms to veterinary offices, new residents have to find their community staples. Our Town America presents new movers with a welcoming package filled with discount offers to local businesses, delivered right to their mailbox. These offers can serve as a convenient starting point for residents as they work to establish their new normal. America’s New Mover Marketing program. After moving to the area a few years ago to be closer to her child’s school, Serentill was greeted with a personalized New Mover Welcoming Package from Our Town America. She was immediately drawn to the colorful, appealing offers. Upon flipping through the offers, she discovered a free pet exam from her neighborhood vet, Laurel Road Veterinary Clinic. This piqued her interest as she herself was a veterinarian and was seeking employment close to her new home. Dr. Serentill realized the veterinary clinic was within walking distance of her new house. She decided to stop by, introduce herself and see if there were any job openings for a veterinarian. Fate was on her side that day; a full-time veterinarian had just turned in their two-week notice a few days before, and the clinic needed a new vet. Dr. Serentill decided a great way to get to know the clinic was to utilize her Our Town America gift certificate for a free, comprehensive exam for her dog, Sarge. During that visit, Dr. Serentill was able to meet the clinic owner and staff members. 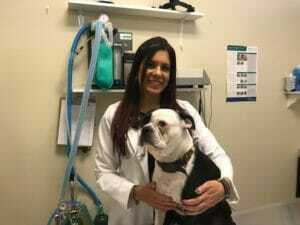 She immediately felt at home and was confident in moving forward with the veterinarian position at the clinic. Fast forward to today, and Dr. Serentill is now owner of the Laurel Road Veterinary Clinic. Our Town America has been helping businesses across the country capture the attention of new movers for more than 45 years. Capitalizing on new residents through appealing vouchers, discounts and unique offers can give local businesses a competitive edge. By providing new residents with personalized coupons, delivered straight to their mailbox, Our Town America helps stimulate the local economy and grow local businesses.